Do Lobsters Feel Pain? | Cape Porpoise Lobster Co. These comments on cooking lobster were prepared by the Lobster Institute. 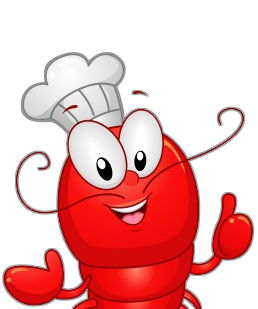 The Lobster Institute has received many inquires about whether boiling lobsters is humane. Being concerned about this important question, researchers conducted experiments and studied the lobster’s nervous system. The nervous system of a lobster is very primitive; in fact it is most similar to the nervous system of an insect. 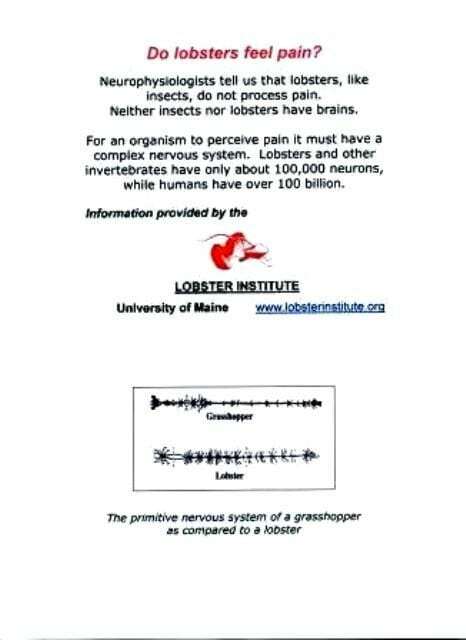 If one compares the diagram of a lobster’s nervous system to that of a grasshopper, the similarities are apparent. Neither insects nor lobsters have brains. For an organism to perceive pain it must have a complex nervous system. Neurophysiologists tell us that lobsters, like insects, do not process pain. Why do lobsters twitch as they cook? Researchers found that a few seconds after a lobster is dropped in boiling water it will begin to twitch its tail. The tail movement, which continues for approximately one minute, is part of a reflex action found in lobsters and crayfish (but not crabs). Known as the “escape response”, it is a reflex action to any sudden stimulus – a reaction that was first identified by George Johnson in 1924. The lobster is reacting to an external factor, such as an elevated water temperature. Can you stop the twitching? in the traditional manner causes a lobster to begin activity in 5-10 seconds and continue for 1–1½ minutes. the lobster by holding its head down and rubbing it nearly doubles the length of time it moves. in salt water from room temperature results in increased activity when the water reaches a temperature of around 30°C/86°F. This activity lasts 2-3 minutes and then subsides. Seems to reduce the activity of lobsters. However, lobsters at the top of the steam rack may still be alive after 20 minutes when large numbers of lobsters are being cooked at once unless the steam is retained in the pot. before cooking, by placing the lobster on ice or in a freezer (but not freezing it) delays the onset of activity about 30 seconds and reduces the duration of movement to about 20 seconds. Researchers believe the best way to minimize the lobster’s movement time is to chill/ice it before dropping it in water that has come to a rolling boil. Hypnotizing, slow heating, and steaming increase the length and duration of activity during cooking.